A friend of mine maintains and writes a great blog called, “Chronicles of a Babywise Mom“. Her blog is amazing and you should check it out. She just recently posted a chart that summarizes your baby’s needs in the first year. I found the chart to be a great run down and a wonderful tool for first time moms. Here is how I vary the toys and the play locations throughout the day. I hope this well help give you some ideas. In the playroom, I have toys in plastic containers with lids. The containers with toys are all kept on shelves I bought from Walmart for $15 each. We have 4 shelves (with 3 shelves each). I only let them get out two containers at a time. I also have a play kitchen in the playroom and a small table and chair set in the playroom. In my son’s room, he has a few toys. The toys are arranged in plastic containers with lids too. He is allowed to choose 2-3 different type of toys to have out during roomtime. The rest stay on his shelves in their containers and are not played with. The kids also do sibling playtime in Coopers room a few times a week- and the same rules apply, only 2-3 types of toys out at a time. In the Gameroom, I store all their educational materials, art supplies, and other table activities. I have it stored in an entertainment system with doors. I have things in plastic containers with lids marked with what time of things are inside. We don’t really have any other toys in the gameroom because we don’t play too much up their yet because I cannot keep an eye on them in there if I am down stairs working (game is upstairs). In the living room, I have a basket of random toys- some cars, some stuffed animals, some little people stuff, some other toys (doctor kit, etc). They can take anything out of the basket when we are in the living room, but it all has to be put back when we leave the room. In my bathroom, I have a small tub of toys for when I am getting ready in the morning or during bathtime. I usually bathe all the kids at the same time, but they don’t all get in the tub at the same time so I need toys to keep the occupied during bath time. I have books, cars, and a few small toddler-ish toys in there. In the kitchen, I have a few leap frog toys on the fridge and I also have some file folder games, busy bag activity, quiet books, and play dough items all stored in my pantry. That way if I need a quick table time activity for a time of transition or while I am cooking dinner, I can quickly pull them out. What I have found, is even though I don’t rotate all the toys, I think allowing them only a few toys at a time helps. Having them play in the playroom, bedroom, and living room at different times of day helps too. I think that free play, Independent Play Time, and table time/ blanket time help to keep it interesting. I also do outside play every day and try to include a walk. So variety of activities, organized toys, and not allowing them to play with too many things really helps to keep the kids happy and having fun throughout the day. The toys don’t get as boring this way. I realize it has been a while since I updated the schedules I have kept with my Son, now 3 years-old, and my twins, now 18 months-old. So here are the updated schedules. These schedules are just the bare bone schedules which include, eating, sleeping, and waking times. For a more detailed schedule that consists of a break down of various activities, please see the other posts below. I am a firm believer in blanket time. I am so glad that I did blanket time with all 3 of kids. It has taught my kids respect for boundaries, discipline, and allowed me time to get things done around the house without having all 3 of my kids under my foot. I wrote a longer post, entitled Blanket Time, about the benefits of blanket time and for a further explanation on how to start blanket time. Here is a short video clip of my 13 month old twin girls during blanket time. Currently they do blanket time for 30 minutes in the morning while I do circle time (learning activities) with their older 2.5 year old brother. When I recorded this video, their older brother was visiting his grandparents (which is why I had a chance to capture this short video clip). Cooper loves cars. I think I must have said this in more than one post, LOL. But when I need a quick and easy table activity to keep him entertained for 15 minutes, this is a winner. All I did was pour some brown rice into a cooking pan. Then I gave some cars to Cooper. 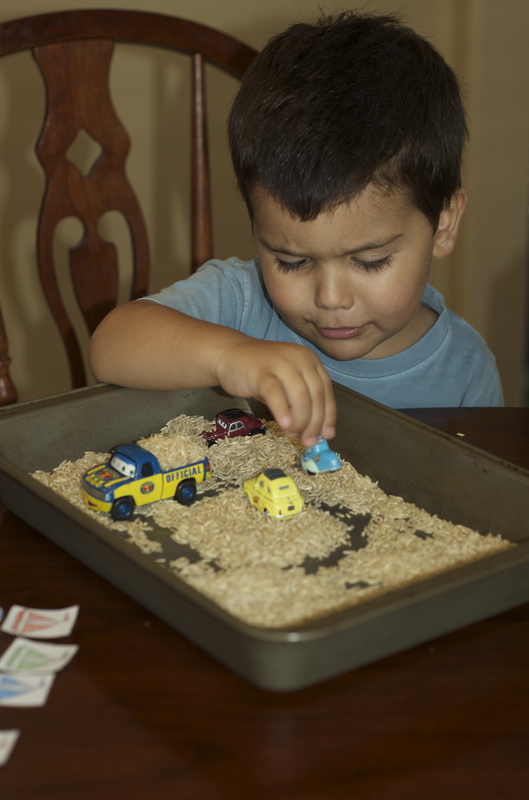 Cooper thinks he is driving his cars through “dirt”. Quick, Simple, Engaging, Loving it! We’ve been using this activity during table time and during times of transition. I use times of transition as educational times as well. I just have Cooper do a brief table time with a short activity he can do independently. 3. Table/ Blanket Time: I use this as a time for Cooper to do an activity at the table that he can do independently that reinforces the skills that he has already learned. I also use this time to let him play at the table or blanket, so it is not necessarily always academic. 4. Family Game Time: 2/3 the time this is educational. I like to get my husband in on Cooper’s learning. So we tend to play games that reinforce the skills that Cooper is learning. Most of the time, it is just repeating an activity we did earlier in the day, but now Cooper gets to show dad what he learned. Cooper LOVES to do his learning activities and games with dad. He gets so proud of himself. The twins (13 months old) only have about 15-20 minutes of structured learning right now. I do it in the morning after they first wake up. They are also read to at snack time. They have blanket time in the playroom while Cooper does circle time, so they hear us sing our songs and chant our rhymes, but obviously they are too young to participate yet.